The University of North Alabama is accredited by the Commission on Colleges of the Southern Association of Colleges and Schools to award bachelor’s, master’s and education specialist degrees. 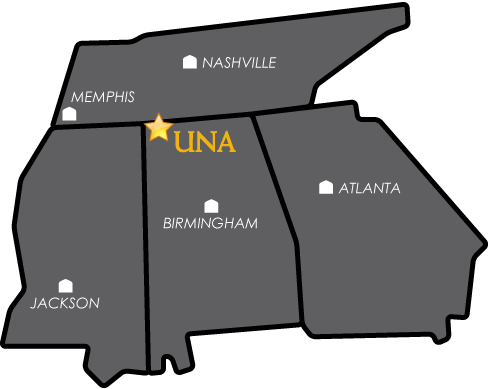 Contact the Commission on Colleges at 1866 Southern Lane, Decatur, Georgia 30033-4097 or call 404-679-4500 for questions about the accreditation of the University of North Alabama. All teacher certification programs are accredited by the National Council for Accreditation of Teacher Education (NCATE). This accreditation covers initial teacher preparation program and advanced educator preparation programs. NCATE is recognized by the U.S. Department of Education and the Council for Higher Education Accreditation to accredit programs for the preparation of teachers and other professional school personnel. The Clinical Mental Health Counseling and the School Counseling graduate programs in the Department of Counselor Education are accredited by the Council for Accreditation of Counseling and Related Educational Programs (CACREP) under the 2009 CACREP Standards. The Connie D. McKinney Department of Human Sciences, Hospitality, and Design is accredited by The National Kitchen and Bath Association (NKBA). The interior design program leading to the Bachelor of Science in Human Environmental Sciences with a concentration in Interior Design is accredited by the Council for Interior Design Accreditation (CIDA). Award of CIDA accreditation attests to the quality of the interior design program and benefits the public and program in many ways. Parents, students, and employers of graduates can be assured that the program meets the rigor of peer review and develops the skills and knowledge required to practice interior design.